Proposals to restructure electric utilities have heightened interest in understanding what factors contribute to the variation in system average rates (SARs) across utilities. Direct comparisons of utilities' average rates have been used to assess management performance and the possibility of using mandatory restructuring to reduce rates. However, direct rate comparisons can lead to highly unreliable conclusions because they ignore the wide variety of regional, economic, and regulatory factors that affect rates across utilities. This paper presents a statistical benchmark study of SARs using 1984-93 data on 99 U.S. investor-owned utilities. The model is applied to evaluate the electric rates of three California investor-owned utilities. We find electric rates are affected to a large extent by factors outside the direct and immediate control of management. Controlling for these effects, there is no evidence that these California utilities, which have relatively high system average rates, suffer from poor management performance. We examine recent evidence on the economic performance of the U.S. independent electricity generation market. A sample of power purchase contracts for 26 independent power facilities is used as the basis of this assessment. The contracts were executed in various years between 1987-94. We describe qualitative features of the contracts, including dispatchability and allocation of fuel price risk. We standardize the price formulas of the contract sample and conduct a simple statistical analysis. Because of residual price variation and an indication that buyer willingness-to-pay is highly correlated with price, we conclude that bulk power sold by independent power producers is a heterogeneous product, and evidence for competition in market prices is weak. Most estimates of the free rider fraction are based on ex-post surveys of program participants. Program participants who indicate that they would have made the supported changes without the program are labeled as "free riders." This paper provides an estimate of the free rider fraction based on consumer actions. A set of energy-use clusters acts as a base against which the likely behavior of consumers in the absence of an efficiency program can be assessed. The clusters can also be used target spending at customers who are least likely to invest in efficiency on their own. The Actions-Based estimate does not suffer from the biases implicit in the standard ex-post survey estimates. The current and potential benefits of European East-West gas trade are enormous for all participants. The new and more complex structure of the natural gas transit system, as emerged with political and economic changes in Eastern Europe and the former Soviet Union, has created uncertainties about the interdependence and interactions among the participants. Using a Stackelberg game with three layers of players (suppliers, transiters and importers), this paper establishes a framework to analyze rational behaviors of the participants and reasonable ways to formulate transparent, flexible, and incentive-compatible contracts. This framework is also used to show how to modify the trade contract to accommodate changes in the gas trade environment. Improving predictability of the players' reactions to external changes can enhance the reliability of gas trade and allow its expansion to benefit all participants. 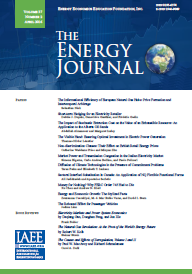 This paper examines the connection between market power and the size of efficiency loss in a market for tradeable CO2 permits. Countries, not firms, are the players in the market. A situation is analyzed where some of the, participants have market power, i.e., they can influence the price of a CO2 quota. Each country with market power decides how many quotas to buy or sell, given the other market power countries' sales or purchases of quotas, and the behavior of countries without market power. The latter countries act as price takers. The market equilibrium is compared to a cost effective market situation in order to quantify the efficiency loss resulting from market power.